It's time to tell you about the Epic Cake, mmmkay? This cake, I am so very sorry to say, is not for the novice baker. Had I made this cake when I had less experience under my love handles it would have undoubtedly ended up smashed against the kitchen wall. There would have been much throwing and flinging. It would not have been pretty. Those of you with a genetic predisposition for fits that involve throwing: consider yourself warned. You can find the recipe for The Epic Cake here (Feel free to watch the video if you need a visual, and if the sound of Martha's voice doesn't cause you physical pain. Yeah, I said it. ), though I think it is important to remember that it comes from this book —one of my all time faves. Now. 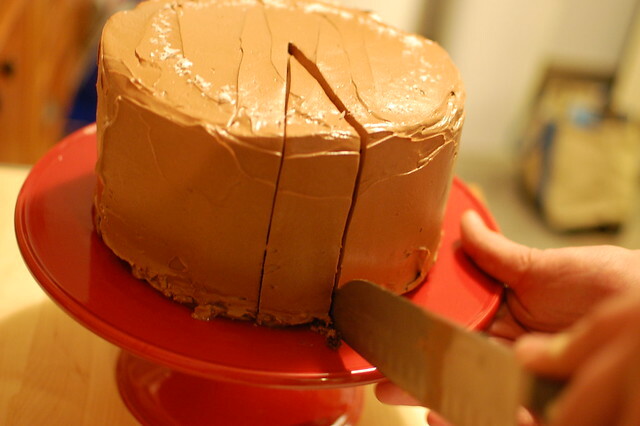 Let's break this down into three obvious parts: The Cake Layer, The Caramel Layer, and The Frosting Layer. 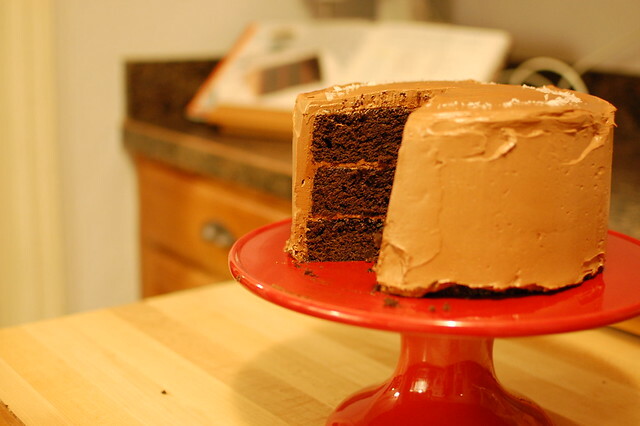 I was singing the praises of this as a basic cake layer with every piece I ate. I thought the crumb was nice and the flavor delish. 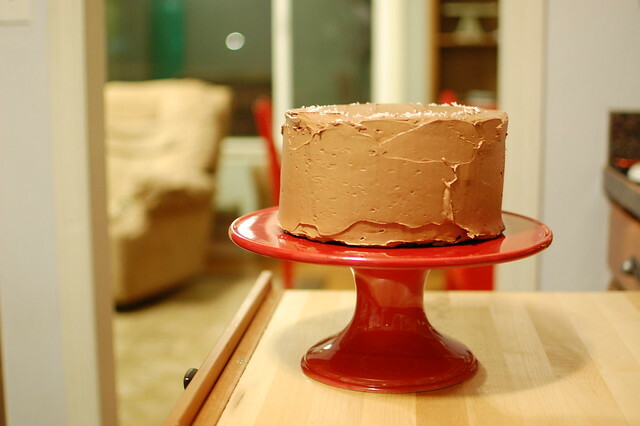 On the other hand, my dear friend—and expert baker—Katie, baked this same cake and declared it to be dry and crumbly. Dear Katie, I have no idea why that happened. Don't you live in a place where nothing ever dries out? I hope you give the cake a second chance. If it happens again I recommend banishing it from your repertoire. I cut the leavening by half (altitude! are you getting sick of hearing me mention that? well too bad, I'm not going to stop) and I watched it closely when it was getting done. I tend to bake my cakes for less time than book recipes call for. The best time to start paying attention is when you can smell the cake and you might notice it barely pulling away from the sides. Four times. FOUR TIMES I had to make this freaking caramel. If you're lucky and don't burn the sugar repeatedly you will only have to make it twice. One batch goes in between the cake layers (drool) and another batch gets incorporated into the frosting (double drool). The caramel sauce is salty and rich and burns really really easily. Keep a constant eye on it and remember that candy recipes are written for sea level. If you don't live at sea level you won't need to get your sauce as hot as the recipe says to. Also, I would recommend squirreling away a little of the sauce instead of putting all of it on the cake. That excess sauce can then be eaten with a spoon. Late at night. By yourself. Just sayin'. You guys, this frosting is not screwing around. It has a pound of dark chocolate and a pound of butter and it knows how to use them. It whips up like a dream and spreads nicely. I LOVE THIS FROSTING. Make it and be brave. And adored by all. You assemble the cake by layering cake + caramel + frosting + cake + etc. Yes. The instructions say to sprinkle a bit of salt in between each layer but I chose not to do that. I was worried that my caramel sauce was already too salty and wanted to play it safe. I deeply regret that decision. Remember, if you're going to make this cake, you have to be brave. Oh, and use the fancy schmancy salt . Okay! Are you so ready to make The Epic Cake? I know you can do it. It's going to be great. I am going to make a cake this weekend, but Will wants to help me, so I think I'm going to not be brave enough for this one yet. Soon. Soon. Yes, I believe this would earn me the love and devotion of all in our household. Looks delicious. I have to tell you the funniest thing....Lucy and I were watching Martha S. together the other day. It was like a marathon thing. About half way through Lucy said "Mom, I like her. We should inviter her over for dinner." She was completely serious too. She started planning how we would decorate and what we should cook. She was totally bummed when I explained Martha probably had other things to do and would not be making it to dinner. Your cake looks delicious, caramel sauce or buttercream is kind of hard to make.I am sure it was worth every slice you had. That cake is killing me softly. Bravo, sister. If I could comment by leaving a picture, I would, and you'd see me sitting in front of my computer with my mouth involuntarily hanging open. Holy toledo, Miranda. Ohhhhhhh. I do so want to make this cake, even though I am one of those genetically predisposed to cake-throwing. I can't stand to listen to Martha's voice. I am one who thinks her ideas and projects (and those of her staff) should remain in print only. So is this frosting kicked up a notch from Grandma's burnt sugar frosting? Do you even remember that stuff? I think your mom made it a time or two. That was good eats, so I'm positive this is better. i don't believe i'm brave enough for this cake. but thank you for introducing it to me. it looks divine. divinely divine. This looks amazing, Miranda. Simply divine. You have one lucky family. Wow! When Chris starts making millions, I'm gonna fly you out and have you make us this cake. Deal? WOW! That is all I can say! ummm.... that cake looks AMAZING. Linked over here from Summer's blog. Oh, Miranda, I love to geek out over baking with you! Rest assured that there is at least one other baker with you in the ranks of FOUR TIMES on the caramel. : ) Even at sea level, that stuff went from zero to torched in 0.27 seconds. And I just may have to give the cake a second chance. You mean it's not cardboard-textured? Hmm. While I didn't throw things, there was the whole explosion of chocolate and glass on the floor. But that's another story for another time, so maybe I'll stop referring to this as That Damn Cake and try it all over again, with your blessing. dear miranda. stop. you amamze me. stop. that cake. stop. delicious. stop. your friend, kim. stop. I agree with Michelle about Mahtha. I haven't commented until now because it makes me so sad. This will not be made in my house, maybe ever. I know I've said it many times, but 'Damn you, Celiac disease!!!' Maybe I need to come visit you and then we'll make it and we can eat it all, without my disease-ridden family? totally drooling. I love sweet and salty.